Expectations were high. Deric and Lynne Salser prepared for the arrival of their second child in the summer of 2002. But in the final days of a “routine pregnancy” Lynne showed signs of distress. Tests showed an unusual condition that threatened Lynne’s life. The “cure” was an emergency C-section that brought relief…and a sweet baby girl, Alexandra! Alex was unaffected by her mother’s traumatic experience. But 36 hours later, she suddenly experienced cardio respiratory arrest. She was quickly resuscitated, but a diagnosis took five long days. Alex is one of one or two dozen children in America with LCHAD, an extremely rare metabolic disease. She’s missing an important digestive enzyme we need to receive energy and nutrients from the things we eat. Despite the rough start, Alex adjusted to IVs and a special formula made for patients with metabolic disorders. Thankfully, it worked for her. And the little fighter was thriving! She wasn’t ordinary and raising her wouldn’t be “ordinary” either! A special formula gives her energy, but it requires a strict round-the-clock feeding schedule which will continue for the rest of her life. Deric, Lynne, and older sister Claire began learning a new “normal” that frequently included a hospital routine. When Alex gets a virus or infection, sometimes she does not eat her special food. And without enough food, Alex’s body “looks for food” from “fatty” tissue, potentially damaging her heart, liver, or eyes. So when formula intake is low, immediate hospitalization is critical…complete with life-sustaining IV nutrition until the crisis is over. 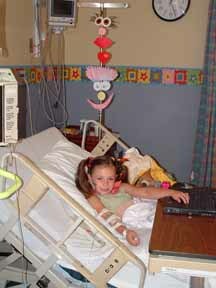 Through the years there have been lots of hospital visits, specifically to Medical City Children’s Hospital in Dallas, Texas. 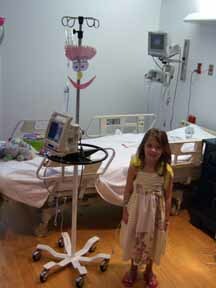 Those days of recovery were lightened by clever characters that Alex and Lynne created to make the ever-present IV pole—with its life-giving fluids—“kid-friendly.” Watery and Flo came to life, making the necessary pole tolerable for the spunky little patient. 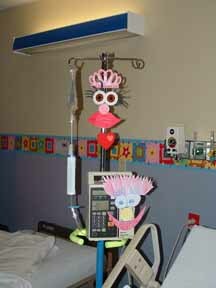 The cheery creations—now known as ivPolePals—have multiplied! They’re ready to be released into the world as critters, picture holders, message boards, patches, logos, and inspirational messages. They offer encouragement for children and adults alike. Each one comes with the “special assignment” that worked for Alexandra—to decorate its owner’s room for recovery!